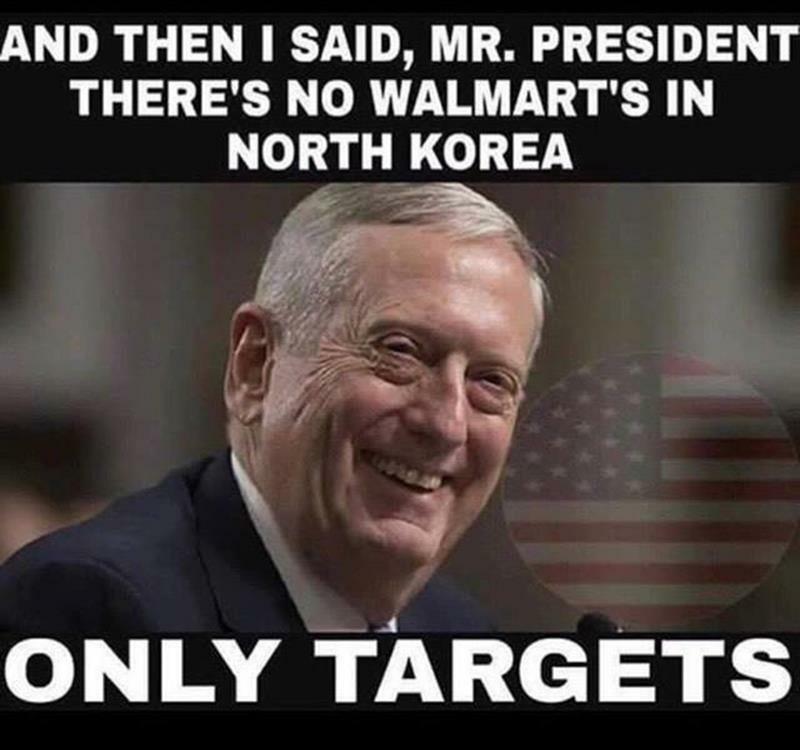 JOKE: Why "Mad Dog" Had to Tell Trump There's "No Wal-Marts in North Korea"
There’s no denying that President Donald Trump’s warning that North Korea can expect “fire and fury” if it persists in threatening the United States was intense. But was it out of line? Democrats sure want you to believe it was. The lefty airwaves and blogs are filled with hyperventilating about how our “warmonger” commander in chief is going to provoke World War III and engulf the world in nuclear explosions. However, conservatives have a longer memory than the average liberal, so we thought we’d remind them what Trump’s Democrat predecessors said about the rogue regime. In 2016, Barack Obama warned the North Korean regime, “We could, obviously, destroy North Korea with our arsenals.” Of course, that proved to be empty talk, contributing to the threat growing into what it is today. Huh. I guess Trump the cowboy wasn’t the deciding factor to North Korea’s belligerence after all. The “strategic patience” of the D.C. foreign policy establishment has failed to stop the North Koreans. For decades, the policy in Washington was to engage in diplomacy with the regime, make agreements to ease sanctions in return for guarantees that Norks would halt their pursuit of nuclear weapons, and watch helplessly as they violated the terms of the agreements repeatedly. Consider how President Bill Clinton reached an agreement in the 1990s that he thought would end North Korean nuclear ambitions and make the world safer. The U.S. would provide oil, two light water reactors, and an electric grid, all worth billions of dollars, in exchange for promises that the regime would cease its pursuit of nuclear weapons. The Democrat plan is to terrify everyone into thinking Trump is a loose cannon who can’t wait to ignite a nuclear exchange. Hillary was even doing it during the 2016 campaign. The fact is that there’s a madman threatening to annihilate Guam, and we’re forced to take him seriously because Democrats placed him on the path to the weapon he currently has. God help us, the world stage has become a dangerous place. How do you think these crises will end? Let us know in the comments.